The mission team of the Civil Service Commission (hereinafter referred to as CSC) of the State of Kuwait, with H.E. 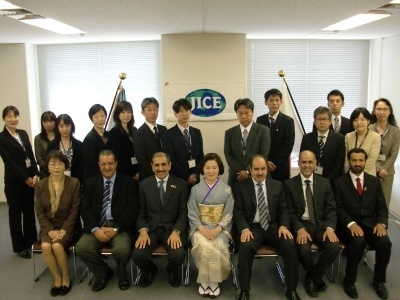 Mr. Mohammad Al-roomy as the head of the delegation, visited the JICE office to sign the partially revised MOU with JICE President, Ms. Sachiko Yamano on March 24th, 2014. The MOU, concerned with the cooperation of the human resource development for the governmental officials of 51 ministries of the State of Kuwait, was co-signed by CSC and JICE on June 14th, 2010 for the first time. JICE has contributed to accepting more than 100 participants who are the middle class officials from the Ministry of Public Works, Ministry of Health, and Ministry of Electricity and Water since the time by developing, organizing and coordinating the training programs. The MOU is partially revised for the both sides to understand the practical content of the cooperation clearly. H. E. Mr. Al-roomy extended the remarks that the newly signed MOU would enable to expand the cooperation of the human resource development in the future. The Kuwaiti national TV crew made an interview on H.E. Mr. Al-roomy and Ms. Yamano on the same day on the future scope of the cooperation between two organizations, which was broadcasted in Kuwait in the following days. 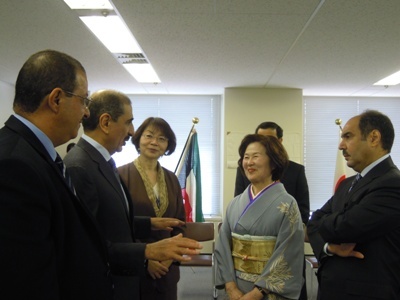 The Kuwaiti mission team made courtesy calls to the Ministry of Foreign Affairs and the National Personnel Authority, followed by the visits of several related sites after the MOU signing ceremony, where some training programs were conducted in the past couple of years for the Kuwaiti governmental officials such as National Center for Cancer Research and Tokyo Women’s Medical University as the venues for obtaining the knowledge of the highly advanced medicine in Japan, 2020 Tokyo Olympic sites as the venue for observing the technologically edged and ecologically friendly facilities to be constructed, etc. The visits of Hakone and Odawara Castle one day before the signing ceremony were quite impressive by the welcome of the early blooming cherry blossoms. They took a journey back home on the 28th and the 29th of March respectively by the seeing off of the fully bloomed cherry blossoms in Tokyo at that time.